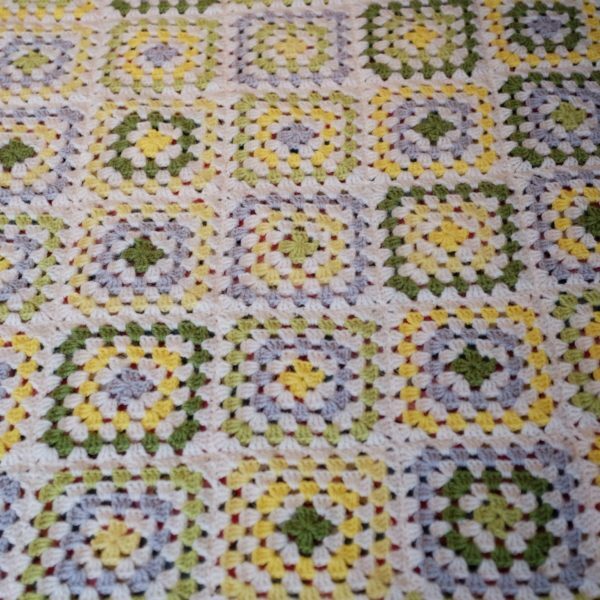 My favourite kind of crafts are simple ones. Minimal preparation and skill are good. No mess is even better. I got the idea for these no-sew lavender bags from my son’s school. They’re definitely simple. They’re also really useful – lavender not only smells lovely, it protects your clothes from moths too. Cut out some circles of fabric. I drew round a small plate with a diameter of 16cm for mine. Use pinking shears if you have them as this will stop the fabric fraying, but don’t worry if you can’t. 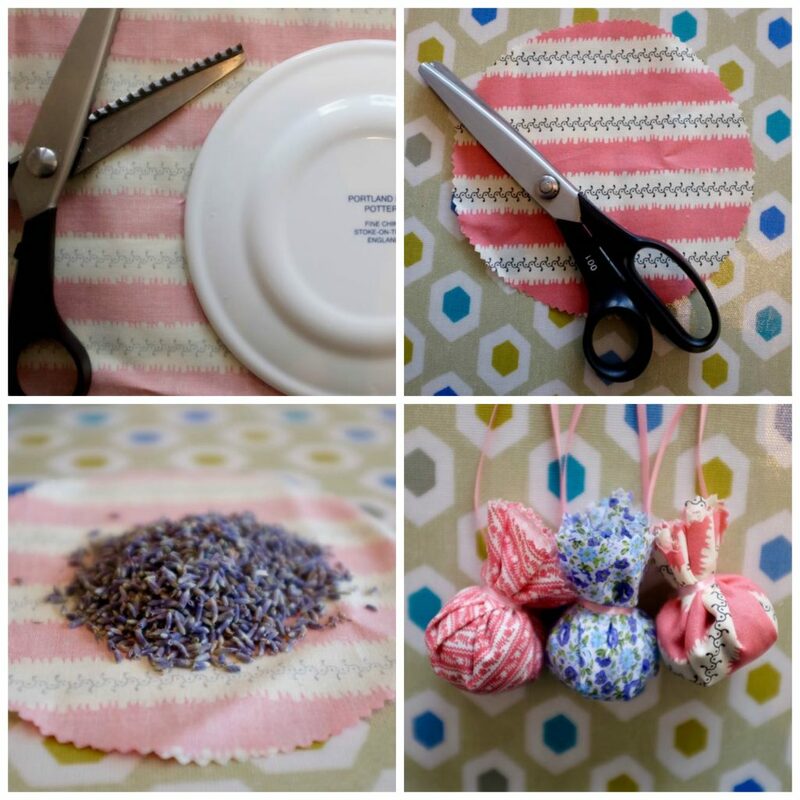 Place about a dessert spoon of dried lavender on each circle, then bring the fabric together in a bunch and secure with some ribbon. You can leave the ends of your ribbon long and tie them into a hanging loop if you like. And that’s it. 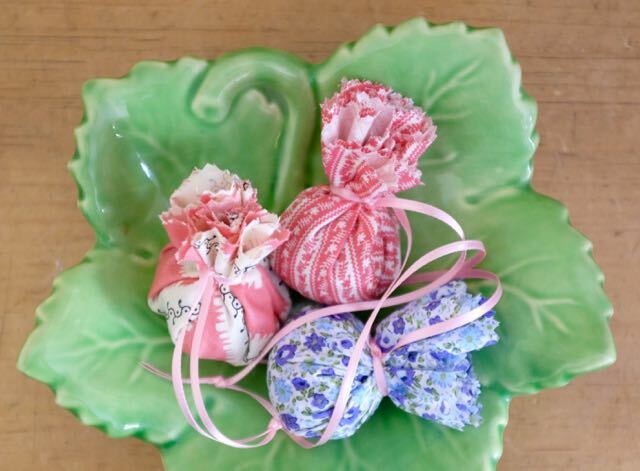 A little lavender bag for your wardrobe or drawers in five minutes. I bought a huge bag of lavender from Norfolk Lavender, and all fabrics were scraps from other projects. You could re-use old fabric, or even use the feet off an old pair of tights (although, naturally, this won’t look so pretty!). If you're not already a subscriber to Marmalade Pie, please sign up. You'll get all my new posts by e-mail as soon as they appear. 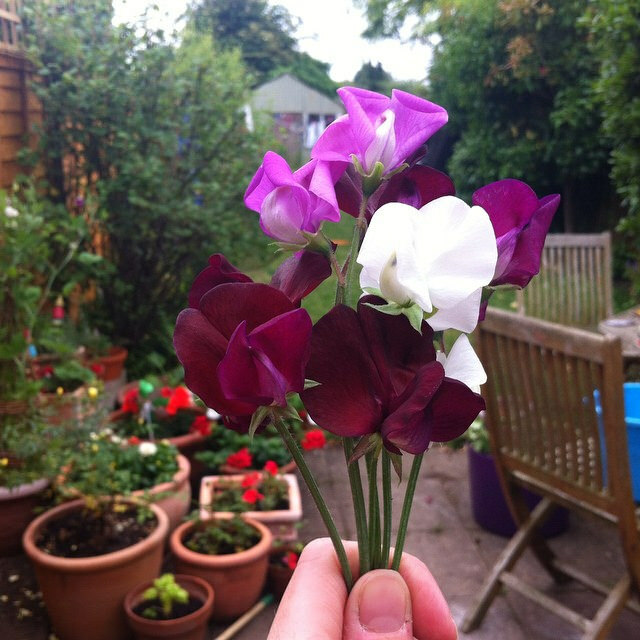 They are gorgeous, so simple and so pretty! 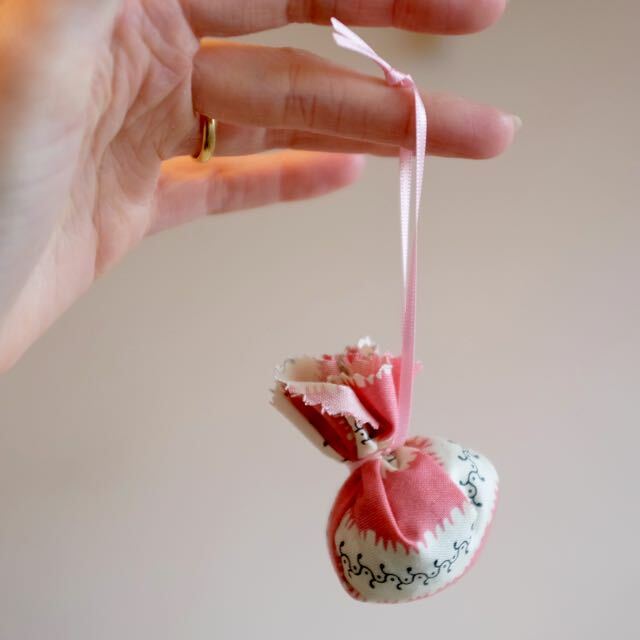 I love making lavender bags, in our old house we had huge lavender bushes all around the front garden and I was so sad to leave them behind, I harvested loads before we left! Thanks Jennifer! 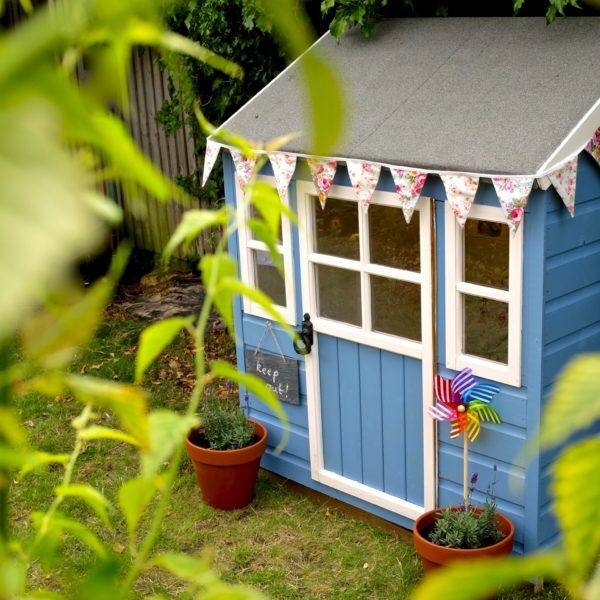 I would love to have more lavender in my garden, I must get on and plant some! I think I might give these a go! Give them a try, they’re so simple! Thanks Emma! The children at my son’s school made these at a seventeenth century day and they all loved it! These are so sweet! 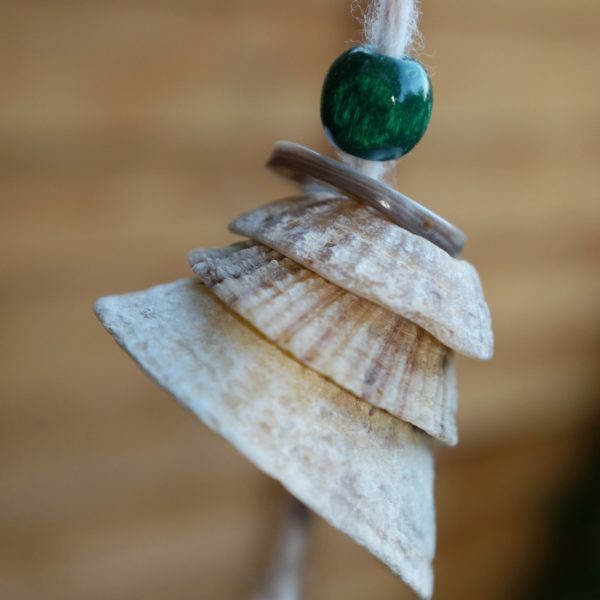 They would also look lovely as little present toppers tied onto a gift.